Copyright (c) 2015 Dan Reynolds. Copyright (c) 2015 Mathieu Réguer. The Biryani typeface is a libre font development project. 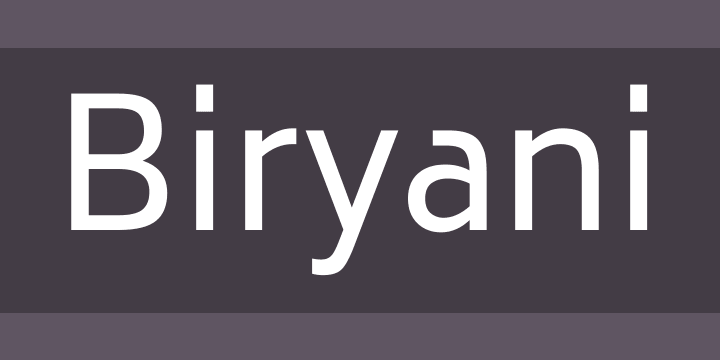 Like several early geometric sans serifs from the 20th century, Biryani’s characters have a strong flavor to them. They are more wonky than sterile. Their design is monolinear. While Biryani is meant for use in text, it is not necessarily optimized for very long passaged intended for immersive reading. At the end of the day, its letterforms are a bit too “display” for that. Fonts from the Biryani family are available, libre and gratis. First published in 2015, the typeface was developed by Dan Reynolds and Mathieu Réguer. Currently, the the Latin and Devanagari scripts are supported, meaning that Indian languages like Hindi, Marathi, and Nepali may be set with them – in addition to most Western and Central European languages. While Biryani is ready for use today, you might want to view the fonts as public beta software. Although the letters’ sidebearings have been carefully set, the font files currently include no kerning data. The fonts also have only one set of figures (tabular lining) – at least if you don’t count the Devanagari figures. Future updates will include proportional lining figures, oldstyle figures, etc. Small caps are also in the works. The Biryani family currently includes seven weights. All of the fonts are upright; italics may be developed at a later time. In the broadest sense, Biryani is inspired by the work of Rudolf Koch (1876–1934). Aside from an alternate version of the 2 (the “Offenbach Two”), the lowercase “a” and “f” bear similarities to Kabel, a geometric sans serif of Rudolf Koch’s that the Gebr. Klingspor Type Foundry published in 1927. Biryani, however, is not another Kabel-revival. Most of Biryani’s individual characters differ in their forms from Kabel, and the typeface itself leaves a very different impression on the page (in terms of color, etc.). Biryani appears to be clearer, and more modern. It moves away from the strict geometry of Kabel, and does not have Kabel’s rather bumpy rhythm, either. For the typeface’s readability, this is probably a plus-point. Biryani’s name comes from a mixed rice recipe that is popular in Southern Asia. Made with spices, rice, meat and vegetables, the dish’s originals are uncertain.